The burger: I’ll get into the details on the Shake Shack burger extravaganza going on this month at Burger Jones, but first a background note. About a year ago, Burger Jones, the burger-centric division of Parasole Restaurant Holdings (Chino Latino, Manny’s Steakhouse, the Good Earth) started a different-burger-every-month campaign. One with an intriguing twist. The promotion grew out of a light-bulb-over-the-head moment that company founder Phil Roberts had during a visit to London with his wife. The couple picked up a copy of Time Out London, and it happened to be the week for the magazine’s best burgers issue. Great idea, right? A kind of well-researched burger travelogue, or perhaps the burger equivalent of a tribute band. Not the real thing, but close (as in, that's not Paul McCartney up there growling "Back in the U.S.S.R.," but it sure sounds as if it is). Because what materializes at the table is an admirable carbon copy. First up was a stab at the output from In-N-Out, the beloved California-based fast-food chain. A nod to Hache followed, trailed by two L.A. burger giants, Umami Burger and the much-lamented Tiny Naylor’s. Last month’s entry was an over-the-top homage to the ‘21’ Club Burger (a patty with an herbed compound butter inserted in the center) that came with, naturally, a $21 price tag. “You can have a $21 hamburger in December, when everyone out is out celebrating the holidays,” said Roberts. “But come January, you need something inexpensive.” Which is why they went Shake Shack route. Here’s a little Shake Shack backstory. James Beard award-winning restaurateur Danny Meyer (Union Square Cafe, Gramercy Tavern) opened the first outlet – to instantaneous acclaim – in 2004, in Madison Square Park in New York City. The burgers-hot dogs-frozen custard company now operates 63 locations worldwide, and just announced that it’s going public, with the hopes of raising $100 million to fund an expansion into more markets. Might that include Minneapolis-St. Paul? Here’s hoping. 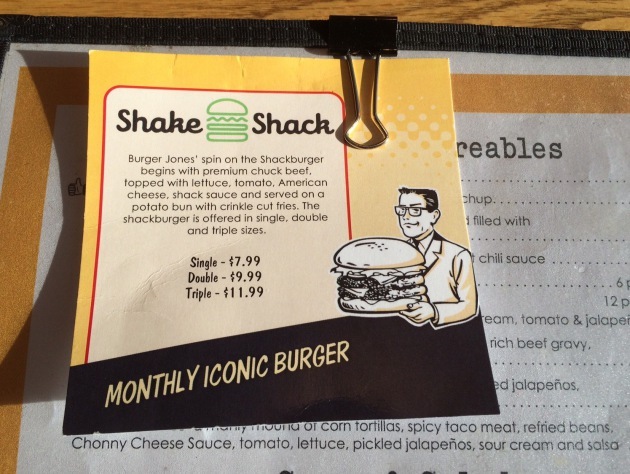 As for the Burger Jones-Shack Shack mash-up, it’s a remarkable facsimile of the real thing, and a total winner. They’re available in single-, double- and triple-patty formats, and here’s how tasty it is: I prudently ordered a single, and had every intention at stopping at my first — well, second — bite, and devote the rest of my lunch to a salad, new year’s resolutions and all. Naturally, I consumed the entire thing. Without thinking. More by primal instinct, you know what I mean? Back to the burger. Let’s take apart its components, shall we? 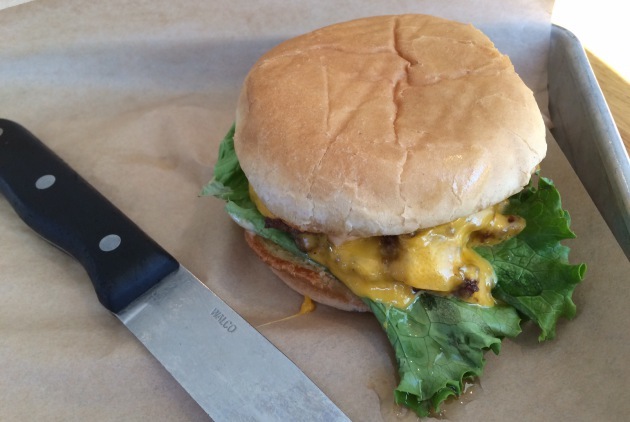 The patty was fine, and notably juicy. My memory says that I think they hit it, landing all the requisite fat and flavor properties. Besides, this isn’t a burger where the patty stands out, it’s more of an ensemble piece, one that where the beef works in concert with a handful of classic condiments. Roberts said that covert formula resembles that of the Big Mac, which I took to mean that it dabbles in mayo, ketchup and pickles. And sugar. Here’s the thing: The sweetness works, in part because, rather than hitting your taste buds like a gigantic bowl of Cap’n Crunch, it sneaks in, and its appeal grows on you. Plus, the prodigious amount of secret sauce splayed across this burger has a way of quickly flipping its initial neat-and-tidy appearance into a gloriously sloppy, two-napkin mess. As for the potato-seasoned bun (imported from St. Agnes Baking Co.), it’s golden, dimpled, carefully toasted and terrific. We’re already into January’s second week, so hurry in, because this blue-ribbon doppelganger isn’t going to hang around forever. Come Feb. 1, the spotlight is turning to a butter burger inspired by Solly’s Grille in Milwaukee. Price: A single patty is $7.99, a double goes for $9.99 and a triple costs $11.99. Fries: Included. All through January, the burger-of-the-month is served with crinkle cuts, mirroring the Shack Shake’s deep-fried modus operandi. Meanwhile, at Salut: Borrowing from Burger Jones, a monthly (ahem) salute is coming to the menu at Salut Bar Americain, Parasole’s French-themed restaurants at 50th and France in Edina and on Grand Avenue in St. Paul. Address book: 3200 W. Lake St., Mpls., 612-746-0800 and 1619 W. County Rd. 42, Burnsville, 952-885-2289, www.burgerjones.com. Minneapolis open 11 a.m.-11 p.m. daily. Burnsville open 11 a.m.-11 p.m. Sun.-Thu., 11 a.m.-midnight Fri.-Sat. Talk to me: Do you have a favorite burger? Share the details at rick.nelson@startribune.com. Thanks.